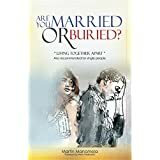 “Are You Married or Burried” will give you therapeutic principles that will give your relationship/marriage a face lift. It is full of experiences from both long standing frustrating and thriving relationships. This book is written for all people that are serious about building exceptional relationships. To help those who are finding it hard to find suitable loved ones. To those who have been paralyzed by divorce and those whose lives are stuck and have lost meaning since the death of a loved one. To those who want to get out of a stressful relationship and yet the heard is still in it. To those who have been tolerating both emotional physical abuse. To married couples who live a lonely and an almost single life. To single people who have been given up on a love and believe that maybe God wants them to be alone. To those who are looking for Ms or Mr right. To those who say “help me get my husband or wife right”. You may have been through horrible love experiences to a point where your perception about a relationship or marriage is highly impaired or even damaged. You don’t believe in a woman or man anymore. You have a conflict in finding a balance between love and money. You need emotional intelligence to handle conflict with more understanding and maturity. You are frustrated by sexual burn out or sexual dysfunction.